One of the coolest things about the backyard game, kubb, is the variety of theories surrounding its origin. Blending the hand-eye coordination of horseshoes with the knock-em-out-of-the-way strategy of bocce, the Scandinavian game of kubb started with the marauding Vikings — not the ones led by Teddy Bridgewater — according to fables. As legend has it, after conquering a village, the Vikings would take the skulls and limbs of the ravaged townsfolk and toss them about to celebrate their triumph. Big fun, right? Others believe the game of kubb is an offshoot of skittles, a European lawn-bowling game (no, not Marshawn’s favorite sideline snack). Whatever its history, kubb (pronounced keb in Swedish) is well on its way to becoming a thing — right up there with frolf (Frisbee golf) and other semi-sports and ersatz games. Recently introduced to kubb, I was pleased — although not surprised — to learn that the game has a cult status in the United States with a number of teams and leagues. While it will never likely to become a sanctioned NCAA sport, players won’t get concussed while tossing a wooden peg in the air. It appears that Eau Claire, Wis. is the designated kubb capital of the U.S., hosting local and national tournaments as well as teaching the rudiments of the game in local physical education classes. Leinenkugel, the overhyped shandy beer from Chippewa Falls, Wis. (22 miles from Eau Claire), has attached its name to major kubb tournaments, even fashioning a wooden game piece (the King, for the record) burnishing its name and logo. See, it’s becoming a thing; there is already a sponsor. Cable TV rights must be on the way. 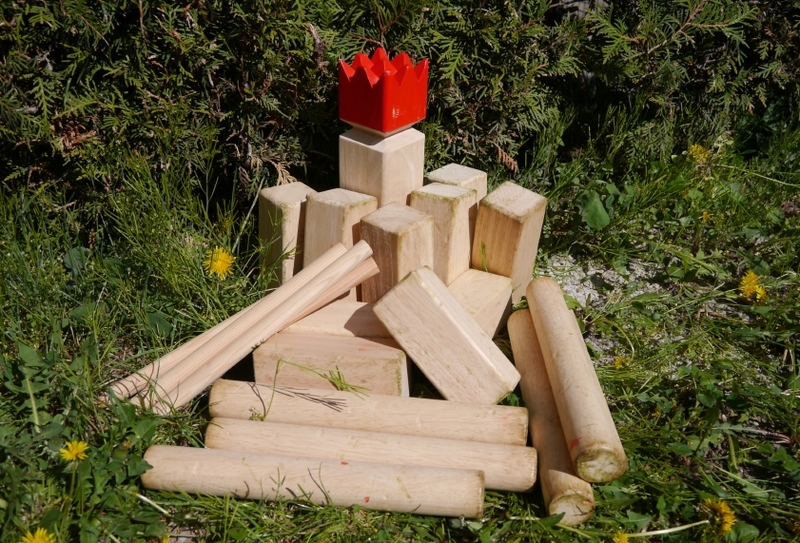 A kubb set contains 10 wooden blocks called kubbs; a king, which is about one foot tall; six batons, each a foot in length; and six marking pins, which are used to create a playing field 16-feet-by-26 feet in size. The object of the game — and this is extreme shorthand — is to knock down the pins on your opponent’s baseline, and then knock down the king. Similar to billiards, the king is like the eight-ball; knocking it down before batting down the baseline pins results in an automatic loss. For a detailed set of rules, check this out. My introduction to the game of kubb came courtesy of a friend who splits time between his home in Finland (a kubb hotspot) and his residence an hour north of Orlando, Fla. He brought this unusual game to his Florida community and started a weekly kubb club (say that fast, five times). Thrown into the fray without much warning, I learned the game the way most people would in the digital era — I watched a series of YouTube videos. Thoroughly confused, I entered the pitch/field/grassy knoll to join a team of four experienced players, and realized after about five minutes that the game was fairly easy to figure out. I was able to get into proceedings once trash talk picked up, stirring my competitive fire. I deployed a strategy in which I tossed the wooden batons with some degree of force, assuming I might get lucky and hit something (or someone) and gain a point for my side. Yep, the tactic actually worked. In the pantheon of sports (or games, if you want to be literal), the game of kubb requires more skill and is more fun that croquet, but you’ll never break a sweat unless you’re playing in Death Valley or in the early afternoon in Orlando. You can buy a kubb set for $50 from Amazon, Cabela’s, and even Walmart. Take your set, find a nice open field, and have some fun. And don’t forget the trash talk.